Slavery here! was a project hosted by museums across the Tees Valley led by Preston Hall Museum. 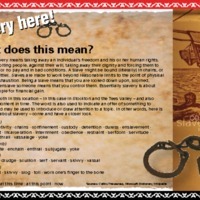 It featured an interactive exhibition to explore the story of the Tees Valley’s connections with slavery. For example, the town of Stockton-on-Tees had its own Sugar House, a refinery that processed sugar from the Caribbean. The exhibition also looked at the work of local abolitionist campaigners Dr Robert Jackson and Elizabeth Pease, and the impact of contemporary slavery on today's society. Alongside the exhibition at Preston Hall Museum, other special events included workshops on African drumming and culture, object handling, and introductions to Fair Trade products. The project also produced a commemorative quilt (in collaboration with Newtown Community) and a film, ‘Manacles and Money’. There aren't any related items yet. Why not view everything in Remembering 1807?